From history to glam, the Beverly Hilton has become a legend â hosting many of the world's iconic guests and important events. The Beverly Hilton is at the heart of Hollywood's most memorable moments in history. has hosted the star-studded Golden Globe Awards with spectacular style and grace since 1961.
and so many more international events. Over a billion dollars has been raised through celebrity-centric charities held at the hotel. The Beverly Hilton is also where Hollywood comes to work. including the 2013 Best Picture of the Year winner Argo. the perfect backdrop for celebrity photo shoots and magazine editorials. of entertainments biggest blockbusters, best sellers, and mega-hits. The Beverly Hilton is where Hollywood always comes to play. No other hotel hosts more parties in one night. Welcome to The Beverly Hilton. 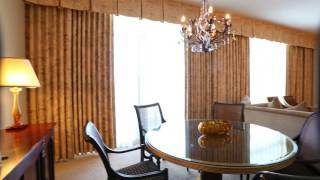 Take a quick tour of the iconic Beverly Hilton as we walk you through the key spots of the hotel. Beverly Hilton Executive Chef Troy Thompson presents the entree he'll serve to guests at the 73rd Golden Globes on January 10, 2016 — a duo of slow-roasted black garlic trout and filet of beef served with spaghetti squash, fried capers and sweet potatoes. Globe Awards. I'm presenting the entree. What it is, is a duo of Steelhead Trout. slowly cooked and then cut out. has already been cooked in the oven with a little bit of honey, salt and pepper, and a little bit of herbs. It's a very healthy dish. I think overall the flavors match, it's a winter time dish. We enjoy cooking it. It's a very popular dish. Take out the sweet potato and put it right below. Put the spaghetti squash right in the middle and that's going to balance out the trout. It's already been basically slow-cooked. What were going to do is brush it with a little bit of black garlic which we make. It changes the texture and color. We're going to drizzle a little red wine sauce on the plate, itself to compliment the beef. And there you go. For the 73rd Annual Golden Globes. 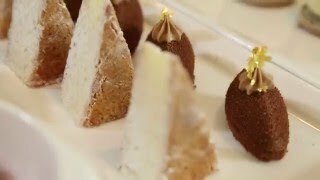 Beverly Hilton Executive Pastry Chef Thomas Henzi presents the appetizer he'll serve to guests at the 73rd Golden Globes on January 10, 2016 — a trio of lemon mousseline croquantine, California almond cake, and carmella, a flourless confection made with Grand Marnier. Enjoy! The red carpet is open at the 73rd Golden Globe Awards! A first-look onto the red carpet at the 73rd Annual Golden Globe awards; live from The Beverly Hilton.